When I came across this recipe a few weeks back, I simply couldn’t pass it up. Elly’s gorgeous photo really helped to prompt me to make something I wouldn’t have normally made on my own and I immediately put the recipe on my dinner menu for the following week. It definitely helped that I had a pork roast sitting in my freezer waiting to be used and that I had almost all of the other ingredients needed already as well. 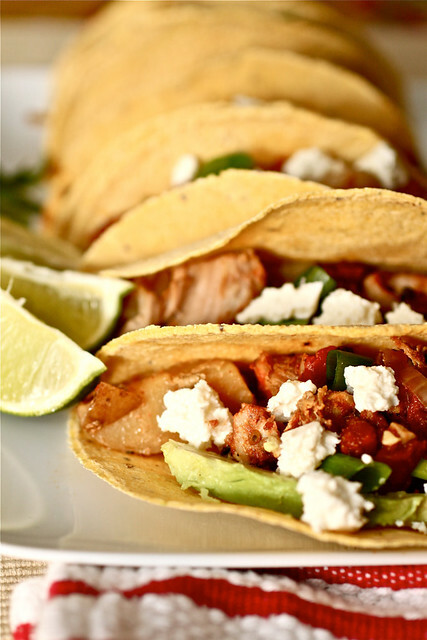 And what’s best about making these smoky pork tinga tacos with avocado and fresh cheese? You’ll toss most of the ingredients in the slow cooker in the morning and come home to a fabulous meal in the evening. And if you works during the day, this is the kind of meal you can truly appreciate!! Now, I’m still a newbie when it comes to traditional and authentic Mexican food so I was surprised to see potatoes included in these tacos but that’s not to say I didn’t like them. 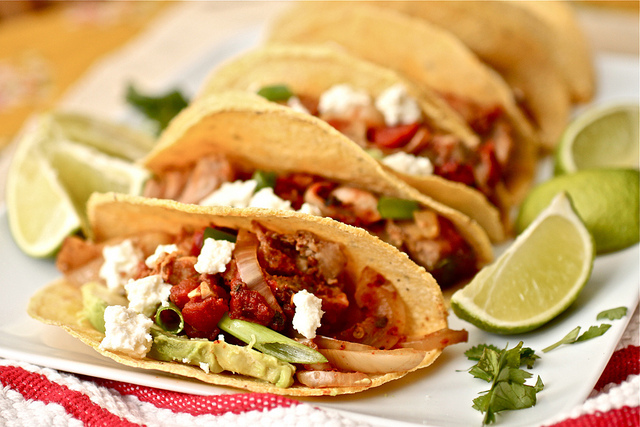 In fact, I loved everything about these smoky pork tinga tacos! The potatoes and tender pork really made for a hearty meal, and the avocado added a nice cooling effect to the smoky and spicy chipotles. All of the ingredients (well…not the avocado) cooked down so beautifully with each other in the slow cooker that you would almost think they had baked together in the oven. Be prepared that the recipe as it’s written was definitely spicy so adjust the amount of chipotles to your tastes – next time, I’ll reduce the amount I add. In case you’re wondering when this string of Mexican posts will end (and I hope you’re not thinking that! ), I’ve got a few more to add over the next few weeks. I’d love for you to share your favorite recipes with me! Post them either in the comments below! source: Rick Bayless, Mexican Everyday, via Elly Says Opa! Cover and slowcook on high for 6 hours or low for 8-10 hours. Wow – these sound amazing! I love Mexican food – and Rick Bayless so I’m very excited to try them. This recipe is getting bookmarked for sure. Thanks for sharing! Always appreciate a recipe that can be done in the crock pot but tastes like it was slow roasted in the oven. Thanks! These look fantastic! I’m seriously considering getting a slow cooker. There is always room for more Mexican dishes….such a great variety to play with. These look amazingly good with such a cool mix of ingredients. These tacos look delicious! I love the flavors. Yum! Slow cookers are just genius aren’t they? I would seriously love to come home to a big plate of these! I LOVE tacos and pork tacos are the best. Love the addition of potatoes to the taco- yum! Oh these are making me soooo nostalgic for Austin. I’m definitely looking forward to trying this recipe!! These look scrumptious! Will be making them soon. As an aside, here in New Mexico potatoes are often included in traditional tacos, especially those made with beef and at home. A few small, family owned restaurants serving New Mexican food also include them in their recipes. And many folks here would not consider their tacos complete without the additional of potatoes! I’ve been looking for creative new taco recipes for Taco Night in my house. This one looks like a winner – thanks for the inspiration!